Apple today released iOS 6.1.3 to the public, delivering several minor enhancements including a fix for a passcode security bug. 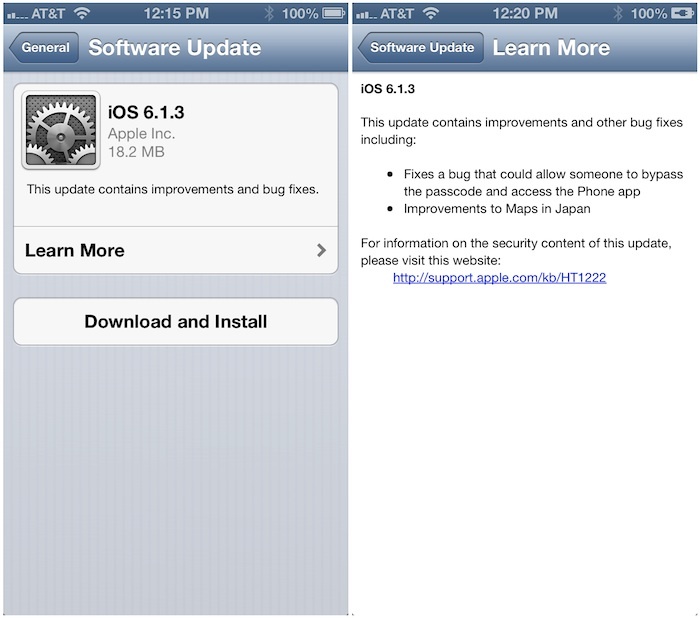 Apple last week quietly delivered some server-side improvements to Maps for Japanese users, but it appears that iOS 6.1.3 also builds in some updates for these users. iOS 6.1.3 began life as iOS 6.1.1 in early February, but was re-labeled as iOS 6.1.3 as Apple rushed out a pair of emergency bug fixes. iOS 6.1.3, which arrives as Build 10B329, also reportedly addresses at least one of the security holes used by the evasi0n jailbreak tool, so users interested in jailbreaking their devices will undoubtedly want to hold off on upgrading until more information surfaces. Is it because you have an Android phone and Verizon must approve of the update like 3 months later? Think ill stick with the build i have + Cydia until apple add a feature to the updates instead of just releasing updates that close jailbreaks. Apple seems to have gone from innovating, to evolving, to stagnating, to normal corporate bullcrap in record time since SJ passed. ...or a fix to patch security exploits that could harm users if used maliciously. The world doesn't revolve around you contrary to what you may think. inb4 did the gears always move when you updated? I'll pass on this update. Please :apple: come out with some amazing stuff in iOS 7. Please spare us all and go get an android phone so we don't have to read negative stuff all the time. Eh. Can't wait to see what iOS 7 brings to the table.